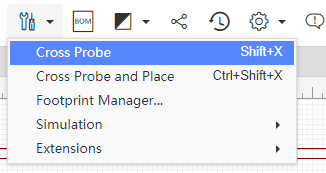 This tool is used to cross probe from chosen objects on the current schematic to its corresponding counterparts in the PCB, or from PCB Footprints to corresponding counterparts in the schematic. You don’t need to open PCB first before using cross probe in the schematic. Editor will open the PCB automatically. And don’t forget to use the hotkey SHIFT+X. After converting the schematic to PCB, for using this function please save the PCB first. If your project has many PCBs, when you use the cross probe that will open the first PCB automatically.